Found 14 file extension associations related to Family Tree Maker and 11 file formats developed specifically for use with Family Tree Maker. With Family Tree Maker, it is easier than ever to organize and preserve all the information you've collected about your family. A new interface makes it much easier to enter, view and edit your data. Timelines highlight personal, family and world events that occurred during your ancestors' lives. A robust tool helps you sort and manage your to-do list. 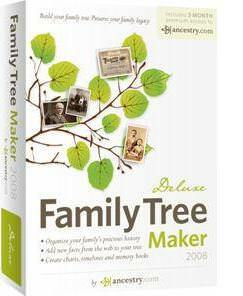 If you need more information please contact the developers of Family Tree Maker (Ancestry.com Inc.), or check out their product website.